The Hidden Ireland...: The right thing to do! Last May an important and indeed unique international gathering took place in Dublin which appears, as far as I can see, to have been completely ignored by the English Language media in Ireland, with the possible exception of RTÉ's on-line news service (surprisingly monolingual for the "national" broadcaster.) With the withdrawal of funds at short notice to the newspaper and internet news service, Gaelscéal, the Irish language print media has been effectively emasculated! This was a the first gathering of the world's language commissioners, The International Conference of Language Rights. The daddy of them all is Canada's Graham Fraser, who occupies the pioneering office of Commissioner of Official Languages, the first such office in the world. The event was organised by our own Commissioner of 10 years, Seán Ó Cuirreáin. 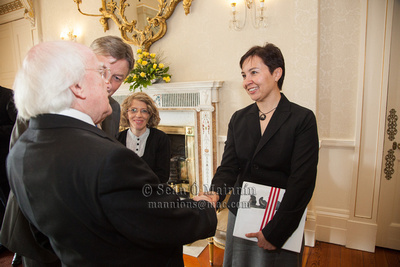 Seán Ó Cuirreáin, (partly hidden) introduces the President to the recently appointed Sandra Inutiq, Nunavut Commissioner. The event was opened at Áras an Uachtarán by President Michael D Higgins himself. In a strong twenty minute extempore address the President said that rights are denied when people are discouraged from speaking a language or when a language is allowed to become subordinate in usage. The speechs and presentations by representatives of linguistic diversity in areas as distinct as Canada, Kosova, Finnland, Catalonia, the Inuit regions of North America and South Africa who shared their experience were shared with an equally diverse group of international delegates. The sometimes controversial nature of the work of a Language Commissioner was thrown into sharp relief when the contribution of the Catalonian Ombudsman, Rafael Ribo, was flatly contradicted by a representative of the Spanish Embassy. A comment by Ireland's Commissioner, Seán Ó Cuirreán, in his presentation also was echoed by other presentors. He described the perception, indeed it appeard to be his own perception too, of the attitude of the Irish state bureaucracy: ""Labhraigí Gaeilge le chéile ach nár labhair linne í! (Speak Irish to each other but don't speak it to us!)" Though the Junior Irish Minister, charged with responsibility in this area, Dinny McGinley, did make an appearence briefly at the meeting, his absence for the bulk of the event perhaps told us more about the attitude of the Government than a thousand words. A very full and accurate report on the event has been published, International Conference on Language Rights, Dublin, May 24, 2013, by the distinguished Swiss based cosmopolitan, Daphne Romy-Masliah, writer and commentator on Multiculturalism, Plurilingualism and waht she calls Cosmopolitanism. The presentations themselves may be found here on the Comisnéir Teanga's website. The talks are in the language used by the speaker. The official languages of the conference were Irish & English and a translation service was provided. A striking sentence made during the day strongly echoed those of the President. "We are talking not only about rights here but about the right thing to do!"